I started using green-er products when I first lived on my own in Paris. But back then, it was hard to compromise, you either had the nice-smelling, well-cleaning products, or the green stuff that didn't smell particularly nice or get rid of the grease in your pots and pans. Ever since my son was born, however, we decided to make a point to use products that weren't as harsh whenever possible. Here are some of our tips, and a brand new line of eco and baby friendly products for the home. ✿ We clean our floors with water mixed with white vinegar. Our house smells like a salad for few minutes, but it's nothing a diffuser can't fix with a nice oils blend, and it goes away on its own. ✿ We also soak our produce in water mixed with white vinegar for 15 minutes in order to get rid of pesticides. We can't always buy organic and that method also saves us some time since we do it as soon as we get home from grocery shopping before putting anything in the fridge. That way, you can grab and go! ✿ I love using the Aleva Stain & Laundry bar to do laundry. I haven't really used it for stains, as I don't really use stain remover in general, but I love it for hand washing delicate knits and lingerie. I find it better than other products that don't rinse out well and are harsh on the skin. It's especially great for my son's knit sweaters and hats which often come in direct contact with his sensitive skin. ✿ We like the Honest Company's multi surface cleaner to clean our counters, dining table and high chair. I used to use harsher products, thinking they would do a better job getting rid of the germs, but I hate the idea of putting harsh chemicals right where we prepare and eat food. I feel so much better knowing my son can play in his environment and touch everything without coming in contact with harsh products. ✿ Dishwashing liquid goes pretty much directly down the drain. 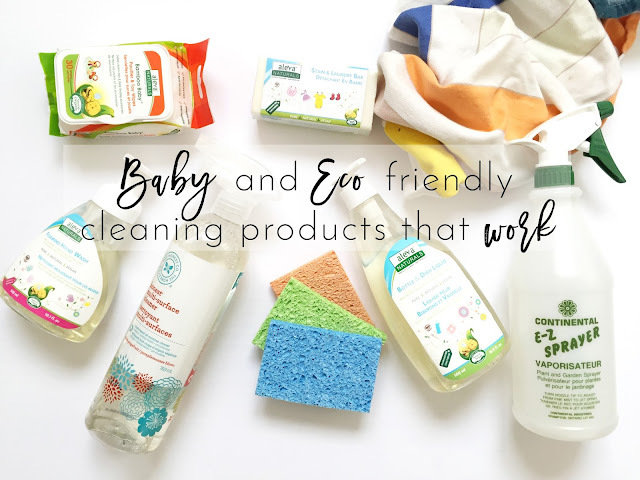 Using greener options is important for the environment, and it's one of the reasons I switched to eco-friendly products. I also started thinking about it more when I had to wash and clean baby bottles and breast pump parts everyday. While we sterilized everything, I also used dishwashing liquid to clean teething toys that my son would put in his mouth. I love that Aleva has a plant-based version that is safe for babies and the environment. ✿ Another way to keep your home clean, the green and easy way is by washing your hands. Sounds simple, but I've noticed it's not a given for everyone. I was born and raised in Paris, where washing your hands the minute you got home was a must. I probably wash my hands a little more than the average person, and that's fine by me. It gets rid of germs and stains on the walls. My son loves washing his hands by himself (with supervision obviously) with Aleva's gentle foaming hand wash. He plays with the foam, his goal is to make it disappear by washing and rinsing - and it smells like fresh peaches! ✿ Toy cleaning can be a pain. Toys are often made with materials that are not easy to clean and not dishwasher-friendly. That's why I love Aleva's pacifier and toy wipes. I've mentioned them here before. From the early months when the paci would fall 54782 times on the floor of the airport to today's wooden and fabric toy that can't be put in the washing machine, those little wipes are lifesavers! What are your favorite green products and hacks?